Your English speaking driver will meet you at your hotel or pick up location in Rome with the requested vehicle to begin this day trip excursion to Siena and San Gimignano. Siena is the embodiment of a medieval city. Siena awaits visitors to provide them an exciting and memorable experience. 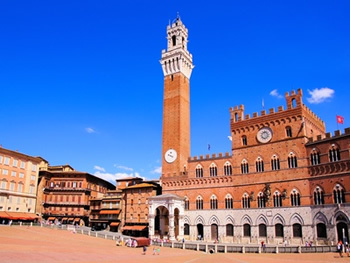 No other city keeps alive the cultural and the civil heritage of the Middle Ages like Siena, the Palio and 17 Contrada, with its masterpieces of art and the historical center like an open museum. In Siena also crafts, food and wine are outstanding which bring a message of culture and tradition. Siena, the capital of the Gothic, from 1995, is part of the UNESCO World Heritage Site. The whole city of Siena, built around the Piazza del Campo, was devised as a work of art that blends into the surrounding landscape. Then we're off to San Gimignano the famous town of the "fine towers". This mediaeval jewel is one of the main tourist attractions in the region. It rises on a one-thousand feet high hill and its towers dominate the Elsa River Valley (Val D'Elsa). Like many other towns in the area, also San Gimignano originates from a small Etruscan village (300-200 BC). It developed then into a town in the 10th century and was named after the Holy Bishop of Modena, St. Gimignano, who saved the village from the barbarians. Once in San Gimignano you will have all the time you need to see the highlights. Return to Rome in the late afternoon. Duration of this daytrip: 11 hours. Comfortable walking shoes and suitable dress for an excursion. Please dress respectfully when visiting religious monuments; local custom requires covering knees and shoulders. Our driver will go at your pace and will allow all the time you need to visit the sites with NO RUSHING as in group tours. Doesn't include Lunch, Private Tour Guide, Meals, Entrance fees and Gratuities.